Today’s Throwback Thursday is, like the Ananya review I posted a couple of weeks ago, another product from The Body Shop. I’m not sure when it was first released but its MUA reviews go back to 2002, in which the first reviewer mentions having used the product for seven years, so I think this product certainly dates back to at least the mid 1990s. The fact that in over twenty years I’ve never tried such a popular product doesn’t surprise me: I’ve never been the biggest fan of The Body Shop, since the majority of their products don’t seem to work well for me (exceptions have been the newer Colour Crush nail polishes and some of the perfumes). Recently, I’ve been bingeing a bit on their products and decided to purchase a small travel sized version of this ’90s classic. Paula Begoun’s Beautypedia totally pans this product, though I noted that they haven’t reviewed it in its reformulated version. The version on Beautypedia’s site lists a metric buttload of parabens in the ingredients, but the new formula from The Body Shop is paraben-free, and also contains hyaluronic acid. An iconic, best-selling facial moisturiser that’s lightweight, easily absorbed, and protects and locks in moisture for all-day hydration, to leave skin feeling fresh, silky-soft and looking more radiant. Now formulated with vitamin E, plumping hyaluronic acid and wheat germ oil, its moisturising effects can help ward off dryness. Use after cleansing and toning, as part of your personalised skin care routine. The mini 15 mL size of Vitamin E Moisture Cream retails for CA$8, but since The Body Shop is constantly running sales, I got it for $4 (with an additional 10% off with my Love Your Body membership, and whatever cashback eBates was running at the time…so, pretty cheap). It comes in a small, plastic screw-top tub that’s an opaque light pink. The cream itself is also a pale, opaque pink, and it has a smooth, lightweight gel-like consistency. The scent is quite strong, as you’d expect from a product by The Body Shop. It’s a sharp, spicy makeup-rose with maybe a touch of violet. I love rose and violet scents, but this is a bit too much for me. The scent lingers on the face, as well, though thankfully with much less power. My skin is quite dry, and I found this to be a reasonably moisturizing product. It doesn’t fully sink into the skin, but this does make it fairly easy to apply foundation on top. The product contains silicones, so I’m guessing that’s what makes the skin feel smooth. This cream is quite economical (when purchased on sale) if it does work for you, however. A little does go a long way. There is something in this formula that does sting sensitive parts of my skin, such as around my nose if I’d been blowing it a lot, or where I might have had a small patch of eczema. It went away quickly, and didn’t manifest itself later as a full-blown reaction, so I’m not too concerned for myself. Those with sensitive skins would probably do well to avoid this cream. Aqua/Water/Eau (Solvent), C12-15 Alkyl Benzoate (Emollient), Diheptyl Succinate (Skin Conditioning Agent – Emollient), Bis-Diglyceryl Polyacyladipate-2 (Emollient), Glycerin (Humectant), Potassium Cetyl Phosphate (Surfactant/Emulsifying Agent), Cetyl Alcohol (Emulsifier), Phenoxyethanol (Preservative), Tocopheryl Acetate (Antioxidant), Caprylyl Glycol (Skin Conditioning Agent), Cetyl Dimethicone (Skin-Conditioning Agent), Glyceryl Stearate (Emulsifier), Polyacrylamide (Film Former), Sesamum Indicum Seed Oil/Sesamum Indicum (Sesame) Seed Oil (Skin-Conditioning Agent), Triticum Vulgare Germ Oil/Triticum Vulgare (Wheat) Germ Oil (Emollient), Carbomer (Stabiliser/Viscosity Modifier), Tapioca Starch Polymethylsilsesquioxane (Absorbent/Anticaking Agent), C13-14 Isoparaffin (Solvent), Parfum/Fragrance (Fragrance), Caprylhydroxamic Acid (Chelating Agent), Capryloyl Glycerin/Sebacic Acid Copolymer (Film Former), Benzyl Benzoate (Fragrance Ingredient), Laureth-7 (Emulsifier), Disodium EDTA (Chelating Agent), Hydroxycitronellal (Fragrance Ingredient), Myristyl Alcohol (Emulsifier/Emollient), Sodium Hydroxide (pH Adjuster), Stearyl Alcohol (Emollient), Limonene (Fragrance Ingredient), Geraniol (Fragrance Ingredient), Linalool (Fragrance Ingredient), Citronellol (Fragrance Ingredient), Cinnamyl Alcohol (Fragrance Ingredient), Alpha-Isomethyl Ionone (Fragrance Ingredient), CI 14700/Red 4 (Colorant), CI 19140/Yellow 5 (Colorant). I’ll use up the rest of this cream but won’t be repurchasing it. I’m glad I only purchased the mini size. For a basic, budget Vitamin E cream, I’ve preferred Jamieson’s ProVitamina line, and I’m sure there are other even better options at the drugstore. 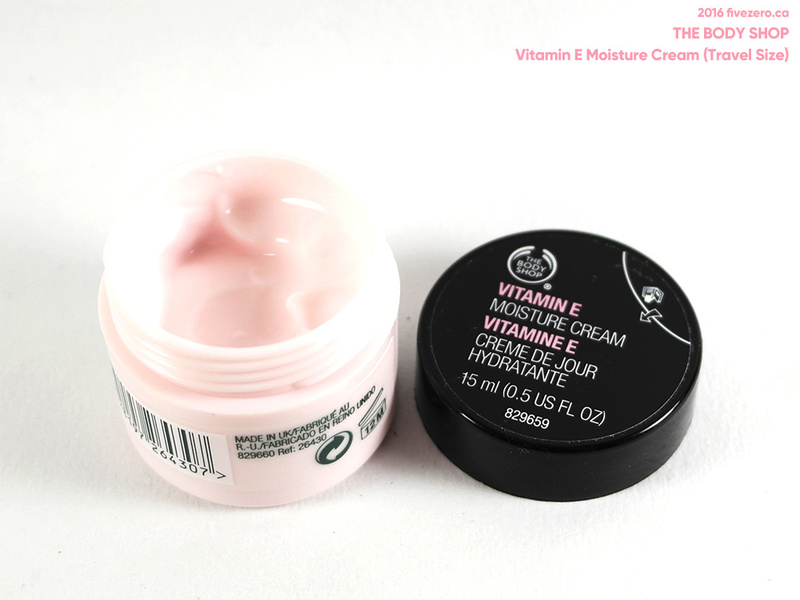 The Body Shop Vitamin E Moisture Cream in the mini 15 mL size retails for US$5 / CA$8. The full-sized product comes in two sizes: 50 mL (US$20 / CA$22 / GBP£12) and 100 mL (CA$34 / GBP£18). The Body Shop is a cruelty-free company. The Body Shop was founded in 1976 by Dame Anita Roddick. It is headquartered in Littlehampton, England. In 2006, the company was acquired by L’Oréal. How timely that you posted this review because I’ve been using TBS Vitamin E Night cream… and it was a disaster. I’m not prone to breakouts but something in that product clogs up my pores. I finally thought to double check the ingredient list and it turns out it’s full of wheat germ oil which is a 5 out of 5 for comedogenic rating! Ugh. And yes, I dislike the smell very much – it lingers too! I wonder what might be causing the stinging on your skin. That happens to me sometimes around my nose but it’s usually because it’s so dehydrated around that area. Oh well. I guess I’ll see what happens. Why TBS chose to feature this ingredient when there are SO many options, is beyond me. It’s bizarre! Probably just a cheap ingredient, is my guess. I’m going to see if I can exchange it in-store…along with the Vitamin E mask I also ordered (UGH). It has a picture of WHEAT on the top. LMAO. I hope they’ll let me exchange.